This is another picture that was directly inspired by my brother Tom, and it was actually based on a promise I made to him several months ago. We were talking about taking photos in public and I told him how I get nervous when photographing strangers because I don’t want to make anyone uncomfortable. His reply was simple: “Dude, they probably won’t even notice you. And if they did, they probably wouldn’t care.” He had a good point, and I told him I would go to the Student Union on campus and deliberately take photos of people to try to get over my public photo phobia. This, then, is a direct result of our conversation. I took several pictures while I was walking around at the Union, some closer to people and some farther away, but Tom was right: nobody so much as batted an eye. And come to think of it, I probably wouldn’t either if some dude came around snapping photos in a public place like that. This one is my favorite of the bunch because it’s got a lot going on, with the two students serving as the main focal point. There’s a few empty warming areas on the left, some kind of eatery in the background, and enough chairs to give the sense that this is normally a busy place. 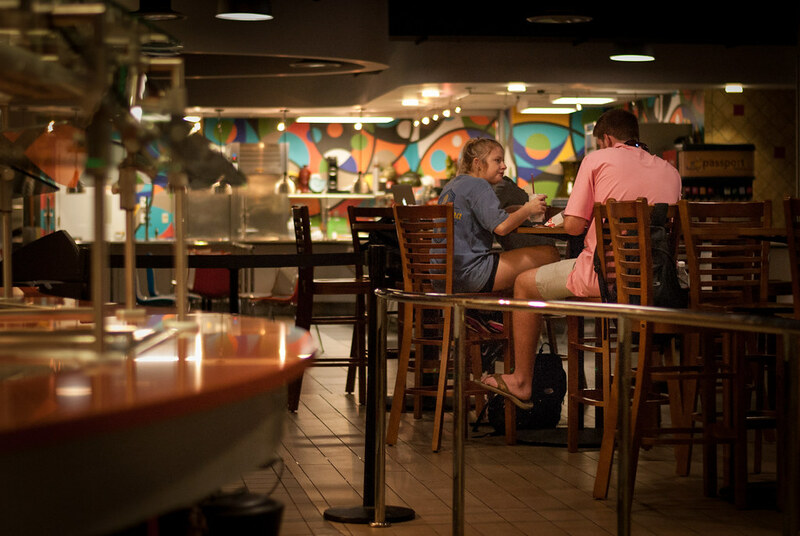 The two students are clearly eating and hopefully enjoying each other’s company, but the backpack on the floor (and what looks like another one on the table behind the girl) gives a clue that this is a college campus and not a mall food court. In essence, it’s another reminder of the importance of context and how everything other than your subject can add just as much to a photo as the subject itself. I made the deliberate choice to shoot at ISO 800 even though that can be somewhat grainy on my old Nikon D200, and f/1.8 in order to get a bit of foreground and background blur. Also, a bit of clarification about the pic: it was not technically dead week when I took it, but the scene reminded me of something you might see on any college campus during the last five days of class before finals. I absolutely share your phobia but I think it comes from the fact that I hate to see pictures of myself so I assume that others feel the same way. That is coupled with the problem that I don’t exactly know what to do with photos of random people after I’ve taken them. Nice job with showing the Union there at OSU. I now know where my two baby girls spent much of their time! I took some time to study the picture and I see what you mean about “context” of a picture. Just got my new Nikon D7100. Looking forward to taking a lot of pictures this weekend. Glad you liked it David, and I’m sure your girls enjoyed many late night meals and study sessions at the Union. It’s a fantastic place to spend time hanging out with friends. I hope you enjoy that D7100 too! I have one and it’s an outstanding camera, and seems to handle almost any situation without breaking a sweat. I’m sure you will get some amazing shots when you take it out this weekend!